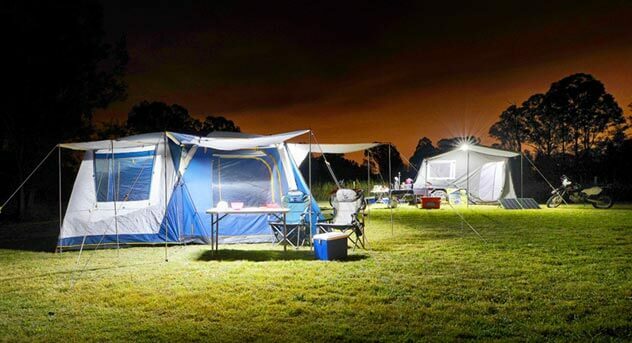 When camping there is a fair chance you will encounter rain at some point, and rather than letting this ruin your experience there are camping in the rain hacks you can do to stay dry and make it tent camping in the rain an enjoyable experience no matter how bad the weather. If there is any sign of rain on your camping trip, be sure to select a campsite which is away from a lake or a river and has a little elevation which runs down from your tent area. Also be sure not to pitch your tent directly under a tree. It might seem a good idea, but long after the rain has finished, there will be a continual stream of rain on tent from the leaves and branches. If there is a heavy storm, these could also fall right on your tent and is something not even the best tent brands could prevent being damaged. If you have erected a rain tarp or tree canopy you need to make sure the area is well lit. A strip of LED’s is ideal for draping around branches and lighting up more significant areas. For more straightforward solutions, you can place candles in mason jars. It should be noted to include flashlights and lanterns along with spare batteries on your camping essential list. If you are out and it goes dark, fastening reflectors to the trees around your tents can make it easier to find where you area is located. After you have completed the daily fun and frolics, there is no reason for everyone to retire into their tents. You can look how to make a rain shelter with a tarp (here) and lay a tarpaulin on the ground and then construct a rain shelter above from one or two tarpaulins. Once this is done, you can add a few chairs sort out the lighting as mentioned above and then crack open a few drinks and snacks and get playing some fun games. Wearing the right clothes and a good system of layers helps to regulate body temperature and eliminating moisture when you are active. This is important when you cool down, and your body temp is likely to drop. Polyester or a wool based mid layers are ideal under waterproof jackets or ponchos. Cotton should be avoided because once it’s wet, it stays moist. this will pay dividends because you won’t be mistaken for some game which is being hunted. To avoid wearing cold clothes you can preheat them ready for the morning. Put the following day’s clothes in a small, breathable bag and place it in the bottom of your sleeping bag. These will stay nice and warm close to your body overnight. Poor circulation can make anyone feel uncomfortable when it’s wet outside. Pack some extra hand warmers and then stuff some in your boots to make your feet nice and warm while you’re eating breakfast. If you’ve been out on a hike and everyone feels cold and miserable, it is time to break out some comfort food. Hot cocoa is ideal because it satisfies on many levels. Stocking up on calories is also crucial in these times because we need these to maintain body temperature. 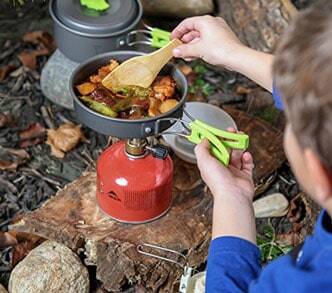 Bust out the carbs and tuck into a campfire pizza or a Dutch oven pasta dish. Wet and cold ground is no fun to sleep on. To stop this you should have an extra layer of insulation which can prevent moisture from rising up, and it also helps to retain heat. When sleeping, you should be sure to keep your face out of your sleeping bag and exposed. 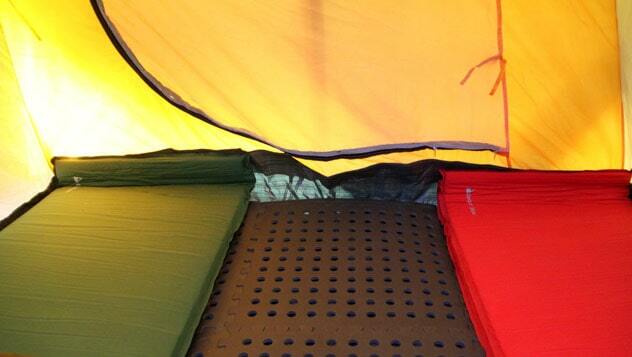 Breathing inside your sleeping bag will cause condensation, and everything inside will become damp. You can also purchase synthetic sleeping bags which can keep you warm even if they become wet. If your clothes are soaked it’s tempting to throw them in the corner and then curl up in your sleeping bag. Wet clothes should be hung to dry, so they don’t smell like mildew in the morning. Be sure to pack a clothesline and hang it under your rain tarp for camping. If you are away for a few days, it can be feasible to take an extra tent, albeit smaller and use as a changing tent where all wet items are removed. This can save the family tent from becoming soggy from people changing. This can also double as a kids play tent during dry weather instead of toys being left on the floor by where everyone will sleep. You can even construct a dry area by using rain tarps for camping, so all the sleeping tents remain dry.